We picked up our first box from Tonnemaker’s fruit CSA this week and–I’m almost sorry to say, for those of you where cherries are already over or not happening at all this summer–I have remembered how good a cherry can be. We got three varieties this week, each better than the last, each cherry firm and impossibly sweet and dripping juice. The kids’ hands have been purple since Tuesday. It was J’s stroke of genius to slice some of the cherries into pancakes, which he did with the girls on the 4th of July. It’s a weekend and holiday tradition of theirs, making pancakes or waffles for breakfast. J seems to have inherited this sweet habit from his own pancake-making dad, which makes it doubly sweet. The cherry on top, so to speak, is that I usually wake up just in time for breakfast (or just leftovers, if I’m really lucky). This recipe is J’s standard buttermilk pancake recipe (from Deborah Madison’s Vegetarian Cooking for Everyone), which he made on this occasion with 2/3 whole wheat flour, those outstanding cherries, and some rosemary candied pecans we had lying around. The result was so good that we ate them plain; the cherries were like built-in jam. You could also serve them with butter and maple syrup, of course. You won’t be sorry either way. 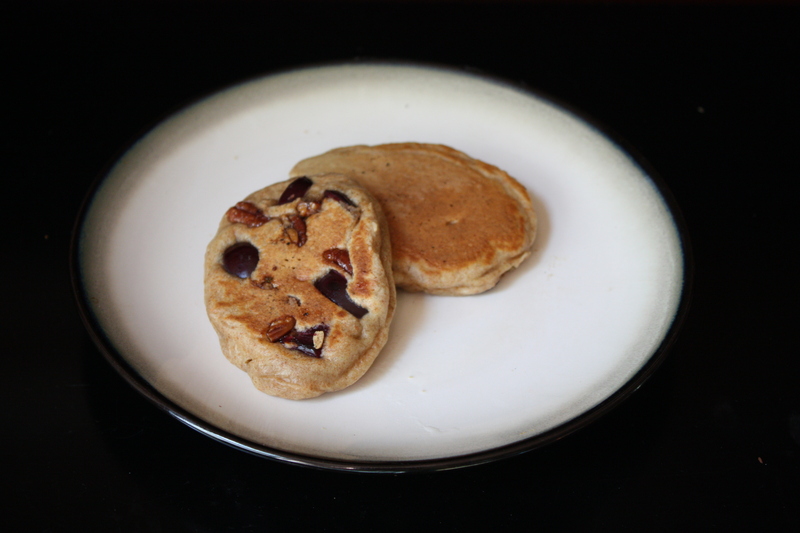 Whole Wheat Pancakes with Sweet Cherries and Pecans: In a large bowl, mix 1 c. whole wheat flour (whole wheat pastry flour is nice if you have it), 1/2 c. all-purpose flour, 2 Tb. sugar, 1 tsp. baking soda, 2 tsp. baking powder, 1/4 tsp. nutmeg and a pinch of salt. In a separate bowl, beat 2 eggs with 3 Tb. melted butter or oil, 1 1/2 c. buttermilk, and 1 tsp. vanilla. Fold the wet ingredients into the dry ingredients just to combine. 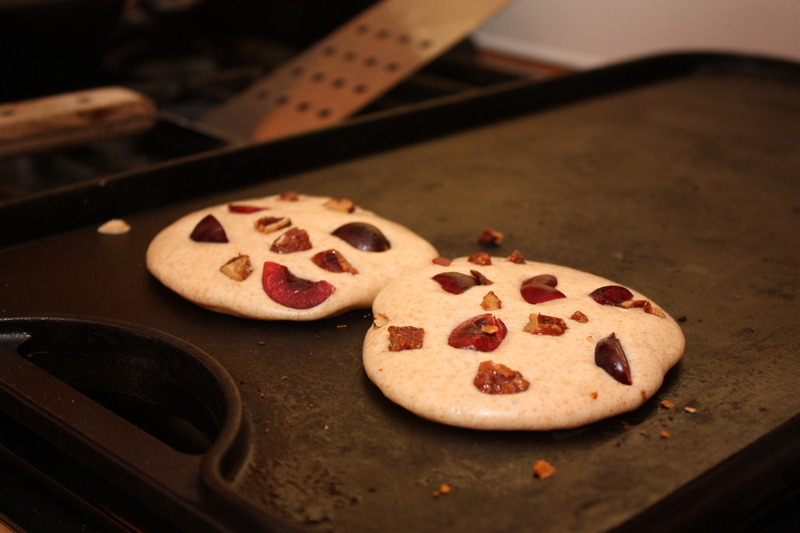 Bake pancakes over medium-high heat, pouring 1/4 c. batter onto the pan for each pancake and topping it with sliced cherries and roughly chopped pecans (the candied pecans were nice but certainly not essential). Flip only once, when fine bubbles appear on the surface and the first side is golden brown. Keep cooked pancakes in a 200 degree oven until they are ready to serve. This entry was posted in Baking, Breakfast, Feeding Kids, Food, Fruit, Recipes and tagged cherries, csa, dads who make pancakes are the best, pancakes, summer fruit, Tonnemaker on July 5, 2012 by emmycooks. Love anything made with whole grain. Yum! Those look yummy. Gotta love a house with both fresh cherries and rosemary candied pecans in the larder! Love pancakes, though for some reason they are a breakfast for dinner item for us more often than breakfast. Love the cherry/pecan combo! This looks amazing! What a good idea to put the cherries in the pancakes. Sadly, our cherries are all gone so I will have to eat vicariously through yours! Cherry season is absolutely fleeting, isn’t it? Love the idea of putting them in pancakes and remembering the pancake Saturdays my sister and I spent with our dad! I host a weekly CSA link party and would love for you to be a part of it! http://inherchucks.com/2012/07/05/whats-in-the-box-33/. Hope to see you there!